The Mac's startup chime can be very noisy, especially in an otherwise quiet environment. Apple didn’t mean to wake the entire house; it just wanted to be sure that you could hear the startup sound, and with good reason. The chime, which usually means your Mac has passed the startup diagnostic test, can instead be replaced by a sequence of audible tones that signal various hardware failures, including bad RAM or EFI ROM (Extensible Firmware Interface Read Only Memory). Over the years, the tones the Mac generates when the startup test fails became collectively known as the chimes of death. As scary as that sounds, Apple sometimes added a bit of humor to the chimes of death, as it did with the old Performa series of Macs, which used a car crash sound. There were also one or two PowerBook models that used a rendition of the Twilight Zone theme. Because the startup chime can provide troubleshooting clues, it’s not a good idea to disable it by completely muting the chime volume; however, there's no reason for the chimes to be set so darn loud. 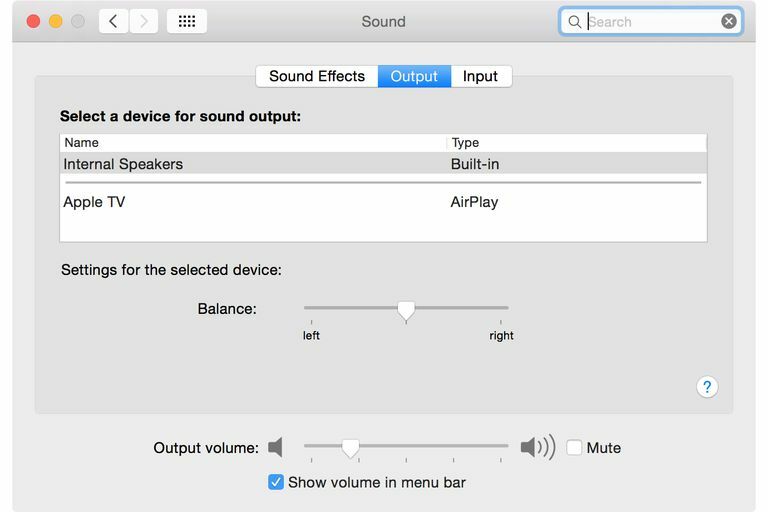 The way to turn down the volume of the startup chime isn't readily apparent, especially if you have external speakers, headphones, or other sound devices connected to your Mac. Nevertheless, the process is easy, if a bit convoluted. Start by removing any speakers or headphones connected to your Mac's headphone/line out jack. Disconnect any USB, FireWire, or Thunderbolt-based audio devices connected to your Mac. Disconnect any Bluetooth audio devices you may be using. With all external audio devices disconnected from your Mac, you're ready to adjust the startup chime's volume level. Launch System Preferences by clicking on its Dock icon, or selecting the System Preferences item from the Apple menu. Select the Sound preference pane. In the Sound preference pane that opens, click the Output tab. Because you removed all of your externally connected audio devices, you should see only a few output options, including Internal Speakers. Select Internal Speakers from the list of Output Devices. Use the volume slider at the bottom of the Sound window to adjust the Internal Speakers volume level. That’s it; you've just adjusted the startup chime volume, as well as any chimes that use the internal speakers. You can now reconnect any external audio devices that were previously connected to your Mac. There's another method for controlling the startup chime volume. Using the Terminal app, you can completely mute any sound played through the internal speakers. This isn't the best option; lowering the volume, using the method above, is a better course of action to take. The advantage of this method is that it will work with any version of OS X, while the simpler Sound preference pane trick is a bit iffy in earlier versions of the OS. Enter your administrator password when requested. The startup chime will now be muted. Once again, you'll need to provide your administrator password to complete the process. Still having problems getting the startup sound back? You can also reset your Mac’s PRAM to return to the system default.